What is the fastest memory card for my camera? We test SD cards and CF cards in cameras to evaluate performance. Fast cards allow your camera to take more pictures in less time as well as transfer images to your computer faster. Buying a fast card does not guarantee high speed, your camera may be a limiting factor. We test a variety of memory cards in each camera to find the best cards. We also test several card readers with different memory cards to find which readers work best for each memory card. New: What is the fastest memory card SD, CF, CFast or XQD? Read more camera and memory card news. 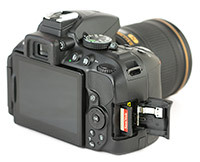 Every camera is tested using a variety of memory cards. The majority of cameras use Secure Digital (SD) cards, while others still use CompactFlash (CF) or both. We test write speed (in MB/s) as well as continuous shooting (maximum frames in 30 seconds) and recommend cards that perform best as well as which ones offer the best value. Below are the most recent cameras tested. Nikon Coolpix P1000 Recommended SD Cards Nikon's Super-telephoto camera is tested with 123 SD cards to see which memory cards provide the best performance. 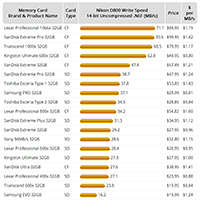 Nikon Z6 Fastest XQD cards compared A test of 10 XQD cards in the new mirrorless full frame Nikon Z6 camera evaluates how memory cards affect continuous shooting performance. Fuji X-T3 Recommended SD cards A test of 116 SD cards in the Fuji X-T3 reveals how UHS-II cards can boost performance. Canon EOS R SD Card Comparison This test of 113 UHS-II and UHS-I SD cards in Canon's new full-frame mirrorless EOS R digital camera evaluates write speed and continuous shooting performance. Nikon Z7 XQD Card Speed Test Nikon's new Z7 full-frame mirrorless camera is tested with several XQD cards to test write speed and continuous shooting performance. See more camera memory card speed tests. Secure Digital and CompactFlash card reviews from several brands. SD card reviews include UHS-I and UHS-II cards, SDHC, SDXC and microSD. CompactFlash tests the latest high-speed UDMA 7 compatible cards. Extensive speed tests in card readers as well as in-camera tests are included with each review. Which is the fastest card? SanDisk Extreme Plus 150MB/s 128GB SD Card Review. The updated Extreme Plus offers up to 150MB/s read speed when used in SanDisk's own reader. Write speed is rated at 70MB/s. See how it performs in various readers. SanDisk Extreme Plus 150MB/s 64GB SD Card Review. SanDisk's Extreme Plus is improved with 150MB/s read speed and 60MB/s write speed. SanDisk Extreme 150MB 256GB SD Card Review. SanDisk's 256GB Extreme card offers improved 150MB/s write speed as well as up to 70MB/s read speed. SanDisk Extreme 150MB/s 128GB SD Card Review. The improved 150MB/s read speed of this card is tested and compared in SanDisk and other card readers. SanDisk Extreme 150MB/s 64GB SD Card Review. SanDisk increased the read speed of the Extreme SD card to 150MB/s when used in SanDisk's own card reader. Write speed is 60MB/s. SanDisk Extreme Pro 170MB/s 256GB SD Card Review. Large 256GB capacity combined with fast read and write speeds make this card ideal for shooting 4K video. SanDisk Extreme Pro 170MB/s 128GB SD Card Review. This card performs up to 170MB/s read speed and 90MB/s write speed, but it requires a special SanDisk card reader to achieve the highest read speed. SanDisk Extreme Pro 170MB/s 64GB SD Card Review. While the increased read speed of 170MB/s is available only in SanDisk's own reader, the card maxes out UHS-I performance in other card readers. SanDisk Extreme V30 A2 microSDXC 400GB microSD Card Review. This high-capacity microSD card offers up to 160MB/s read speed and 90MB/s write speed when used in SanDisk's proprietary card reader. It is tested to see how it performs in other devices. SanDisk Extreme V30 A2 microSDXC 256GB microSD Card Review. This SanDisk Extreme microSDXC card promises up to 160MB/s read speed when used in the appropriate reader. Its performance is tested in a variety of card readers. Patriot EP Series V30 A1 microSDXC 128GB microSD Card Review. Patriot updated the EP Series microSDXC card to include V30 and A1 performance. This card offers up to 100MB/s read and 80MB/s write speeds. SanDisk Extreme 160MB/s V30 A2 microSDXC 128GB microSD Card Review. The latest version of the Extreme microSD provides read speeds up to 160MB/s and adds A2 performance. Hama Memory Pro 4K 64GB SD Card Review. Hama's Pro 4K V30 card is tested for read and write speed. Delkin Premium XQD 120GB XQD Card Review. Delkin's XQD card offers up to 440MB/s read and 400MB/s write speeds. AData Premier One UHS-II V90 256GB SD Card Review. AData's top performing card in the largest capacity available is tested. It outperforms its 275MB/s read and 155MB/s write speeds by a large margin. See more SD card and CompactFlash card reviews. External memory card readers allow high speed transfers between memory cards and computers. Many readers support USB 3.0, which is capable of 500 MB/s transfer speed. These readers are also backwards compatible with USB 2.0 connections and devices. USB 2.0 limits transfer speed to about 35 MB/s maximum throughput. Devices with internal card readers (laptops, monitors, etc.) may also be limiting due to using a slower USB or PCI bus. Hama USB 3.0 UHS-II SD Card Reader Review. The Hama USB 3.0 Reader provides fast transfers using UHS-II and a durable aluminum construction. Hama USB Type-C 3.1 UHS-II SD Card Reader Review. This portable reader from Hama uses USB 3.1 Type-C connection and supports UHS-II SD cards. SanDisk ImageMate Pro Multi-Card Reader/Writer Review. SanDisk updated their ImageMate reader with a new design and compatibility with the latest UHS-II SD cards. Sony S1 High Speed UHS-II Reader/Writer Review. The S1 reader provides high read and write speeds using UHS-II such as the Sony SF-G Series UHS-II cards. Lexar C1 USB-C microSD Reader Review. The Lexar C1 is a compact reader with a USB 3.1 Type-C connection. It reads and writes microSD and supports UHS-I. See additional card reader reviews.